Laying it out like this really does hit home as to the enormity of my collection, with Brickset saying I have 194 different sets, totalling 26557 pieces. Wow. So, that's my bragging done for a good long while, how about you guys? ^ You've got some nice stuff, Eric - excellent ! This is, however, probably not the best place for a 'mine is bigger than yours' bragging session as you are up against some serious heavyweights in here. Prepare to be seriously impressed.....! 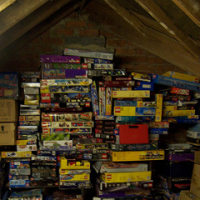 You might want to start by checking out the collections of guys like @Huw and @rocao via their profiles on Brickset. That should give you an idea of what you're up against ! My collection is miniscule comparaed to some of the heavyweights in the Brickish Association, like Michael or Phil. My collection is public on Brickset so you can check it out for yourselves. I am sadly lacking in old 'classic' sets, I only own a few, although I have recently picked up the iconic 375 - Yellow Castle. I have kept precisely zero sets from my youth, we used to live next to a field that hosted car boot sales every weekend so all my collection was sold there...I still haven't got over it. I'm only 3 years out of my Dark Ages, so I think my collection is pretty sizeable when you take that into consideration (560+ different, 730+ including duplicates, over 100,000 pieces) but I still feel like a very small fish in a very big pond. I would love to pick up more classic sets, but I find it's a trade-off between keeping up with the new sets in the themes that I like to collect vs. old sets, at the moment new sets are winning. About 5 years ago I had a massive collection that I sold off. My wife and I had decided to start a family. We had a smaller house back then so we needed the space and the money. I haven't reached the point I used to be at but I probably have 2-3 hundred pounds right now. its a pretty good size considering we are both only 16 and bought most of them ourselves (although we just moved and we are out of money :( ), we dont have any old or rare stuff, but we do have all first 3 series of collectible minifigs. I've been collecting Lego post-dark-age since 1996 and I've just recently eclipsed the 1000 set mark (250k pieces or so). I have focused almost solely on Technic, Creator, Star wars and (until it was recently discontinued), Bionicle. I also have various other mini-fig scale themes too, most from pre-2000 before my boys were born. Notably, I am fairly complete in the themes I collect. Back when I started in '96, I bought up most of the old Technic sets I'd missed out on, and in MISB condition. As I bought them, I promptly opened them up and built them. :) Most have been dismantled now, except for some of the earliest ones. The problem I face today is that my collection is so large, it is not practical to make use of all the pieces. I do have a storage system but it hasn't been expanded in years and is thus woefully inadequate. Parts from sets taken apart in the past five or six years sit in large plastic tubs, unsorted. Furthermore, my lego room itself is essentially a big closet now. There's barely room to go in and build. hello, at age 18 i have 596 different sets ranging from the tiny sets to the Tower Bridge. 600 sets, 130,000 pieces (roughly). I guess size is also relative - I thought mine was pretty big until I got on Brickset and saw some that other people had. "You own 1487 sets (938 different). We have piece counts for 877 of them. Using that data we have calculated that you own 523,369 pieces! I think that I still have about 20% of my sets not yet inventoried. I literally have run out of workable space, so that it's like solving a jigsaw puzzle to go through and inventory everything. Aside from the sets, I also have several hundred pounds of loose bricks and probably another 3000 minifigs judging by the volume they occupy. I'm most proud that I was able to acquire a large portion of the sets that I always wanted from my childhood but was too poor to afford. One thing I've learned is there's always a bigger fish in the sea... except for that one biggest fish. I'm certainly not it, but oh how I would love to be! That is a tremendous amount considering your age! Do you care to share how you managed that? Since i was little, the only thing i wanted for christmas and birthdays and such were LEGO wich added up over the years, and thanks to my parents who kept all their older sets i got a nice collection . Mine is at 83367 elements, but who's counting? Mine is at a mere 269 sets and 65389 pieces. But i am proud of my 80's and 90's town collection! Maybe it would be possible for Huw to analyse the brickset database and come up with a normal distribution curve of members versus sets/pieces, that would give us an idea of where each of us stand. It's just a thought. ^ please let me be above the curve (I'm just a little bit competitive!). My collection is very small compared to others, I only have 18 sets and 54 mini figures totalling 2469 pieces. 81560 pieces over about 225 sets (I tend to prefer the big sets). Also have about 15-20kg of loose, so probably about 100,000 pieces. A more accurate measure would be ..... more than the wife thinks is within the realms of sanity, but not enough that I am satisfied that I dont want anything else. I've got about 25 more sets to add as I filter through a 15kg pickup of old Train and Town stuff from the 80s. How many sets do you buy a year? How long does it take to mass a collection of any size. I have collected 163 sets (95 different) starting August of 09. I am 37 and have become obsessed. I think that I have gone a tad overboard. I have two Lego stores in Phoenix! Well, at least she got you something you could use, right? Can only have just so many sweaters or socks! My collection is public. All I have posted is my complete sets, I have about 400 pound and 1500 minifigs that are in bulk and not categorized. I have finished a room in the basement where my son and I have begun a very long process of building a massive permanent train layout. @wagnerml2: I tried to look up your collection, but it's either not public or your brickset username is not "wagnerml2"
Christmas 2009, when my son was 5, seems to be the starting point for the massive buying spree of Lego sets. Probably have around 40,000 pieces, mostly in sets. with about 10-15% being 'loose'. Eric....I had a room at my work flat....ended up too small. I have now floored the loft at home and have just started building my city there as well as storage for the boxes, etc. According to Brickset I have 100 sets, although they are all predominately Star Wars based. However, it's not so much the amount I own, more the fact what I own is what I want, ie. I have managed to acquire all but 3 of the "UCS" sets including my favourite, the 7191 X-Wing and the 10019 Tantive. I also recently got my hands on the 10179 Falcon and the 10030 Star Destroyer - one for a bargain, one for not (don't tell the wife!). Anyway i'm now considering branching out to other themes, in particular the modular buildings, like the Grand Emporium. Problem is I know when I get one i'm going to want them all including the expensive retired models. I only started my Lego addiction about 2 years ago, after buying my youngest son a star wars set and marvelling how good it looked! Well, my entire collection (760 odd including duplicates) has been amassed entirely since September 08, so by my quick calcs, it's growing at a rate of 25 sets per month! That just links to my owned sets, not yours. @Rocao - You are right! My user name on the forum is Wagnerml2 and my brickset username is Wagnerml! I'll need to remedy that. Here is the link to my collection if you are still curious. I think Huw or bluemoose should be able to fix that for you. @Eric, When we built our new house, I asked the builder to set aside specific space for a room devoted to lego. He thought that was really wierd, but it is a dream come true! ^ No need to quote the text *and* pictures chaps. Think of the bandwidth we'll save [picture now removed from quote above].